Samaritan's Purse teams are working in the Florida Panhandle and Albany, Georgia, to respond to communities devastated by Hurricane Michael. Please continue to pray. LATEST Oct. 18, 8:30 a.m.
Our volunteers are hard at work in Albany, Georgia, and in the Florida Panhandle where our teams have received more than 1,500 work orders between the two locations. More than 300 volunteers so far have helped respond to the need. Many more will be needed over the coming weeks and months. The work consists mostly of clearing downed trees and debris and tarping roofs. Since our Michael response began late last week, 13 people have prayed to receive Jesus Christ as Lord and Savior. Please continue to pray for God’s wisdom and guidance as needs emerge and as our teams continue working in these hard-hit areas. Pray for God to move in the hearts of homeowners so they might seek Him amid this devastation. And pray for comfort for families of lost loved ones as reports come in that the death toll has risen to 32. Tens of thousands of people are still without power. Please continue to pray for our hurricane responses in multiple locations. The Florida Panhandle was devastated by Hurricane Michael. Samaritan’s Purse is there helping them dig out. 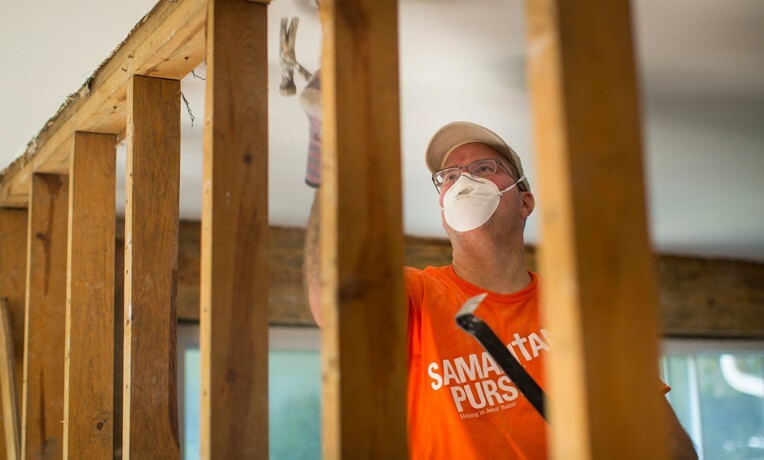 Samaritan’s Purse volunteers are beginning work in the Florida Panhandle where Hurricane Michael inflicted unbelievable damage upon coastal cities, especially Mexico Beach. Our assessment teams continued to survey the wreckage yesterday and to uncover needs of communities where we will help with clean up for many weeks to come. Obstructed and damaged thoroughfares and infrastructure have slowed relief efforts in this widely-devastated region. Our bases of operation are up and running and are receiving volunteers. In Albany 175 volunteers have helped 11 homeowners dig out of the debris. We’ve received more than 640 work orders in the area. We praise God that six individuals have decided to follow Jesus as their Lord and Savior. Please continue to pray for these communities and for our ongoing work in the Carolinas where homeowners are still on a long road to recovery from Hurricane Florence. Samaritan’s Purse has established bases of operation in both Albany, Georgia, and along the Florida Panhandle. Volunteers have already been working hard in hard-hit areas of Georgia, with 132 volunteers responding to 375 work orders. Soon we will begin work in Florida where so many families and residents have experienced unspeakable loss. Please continue to pray for victims of Hurricane Michael as they begin to piece together their lives after this tragic storm. Also pray for save travels and safety on-site for our volunteer teams as they help communities dig out. Weary homeowners have returned to the Florida Panhandle to find shambles and destruction. Timber where homes once stood tells the widespread story of damage throughout the Florida Panhandle. Samaritan's Purse volunteers and Billy Graham Rapid Response Team chaplains pray before work in the Florida Panhandle. Work in the Florida Panhandle continues with volunteers removing downed trees. Trees crashed onto homes in Albany where Samaritan's Purse is assessing damage and deploying volunteer teams to do debris clean up in Jesus' Name. Volunteers sign the front of the Bible that was presented to a homeowner in the Florida Panhandle at the end of their work there. Wind damage is evident throughout Albany, Ga., where Hurricane Michael passed through this week. Volunteer teams started clearing debris from yards and homes throughout Albany, Georgia. Assessors pray with a homeowner in the Florida Panhandle where our teams are beginning recovery efforts this week. Love Whitfield was delighted when volunteers gave her a Bible signed by the team after completing work on her New Bern, North Carolina home. Volunteers clean dishes at the Wilmington, North Carolina, home of Steve and Deborah Hubbard. Turner C. “TC” Bond was among eight military veterans from the Fleet Readiness Center East at Cherry Point who needed respirators to mud-out a New Bern home. Liberty University students serving with Samaritan's Purse helped salvage belongings and clean up the mess in Jacksonville home. For any volunteer questions, call 850-899-6404. For any volunteer questions, call 229-733-4423. Samaritan’s Purse volunteers are working in Albany, Georgia, helping homeowners clear away downed trees and debris and tarping damaged roofs. Assessment teams are in the Florida Panhandle determining homeowners’ needs where many communities experienced widespread loss as homes were washed from foundations by powerful winds and storm surge. The Hurricane Michael death toll across affected areas has risen to 18 people, and hundreds remain unaccounted for. Please pray for protection for emergency workers, our staff and volunteers, and for homeowners as they begin to face the realities of life after the storm. Samaritan’s Purse is establishing worksites along the Florida Panhandle where the entirety of at least one town’s structures are merely splinters and debris strewn along the ground. We will also be working in devastated Albany where church partners report greater damage and flooding than they have ever seen in that storm-weary south Georgia city. Samaritan’s Purse staff are currently on the ground in both locations assessing needs. We will begin receiving volunteers in the coming days. From Florida to Virginia an estimated 1.4 million people are without power. At least 11 deaths have been reported since Hurricane Michael made landfall the afternoon of Oct. 10. Samaritan’s Purse has deployed two disaster relief units to the Florida Panhandle and south Georgia. Billy Graham Rapid Response Team chaplains are also en route to the region where communities and families are in desperate need. Volunteers will assist homeowners with clearing debris and mudding out homes in Jesus’ Name. As Tropical Storm Michael enters the Carolinas, significant rainfall and the potential of tornadoes will threaten the area where homeowners are still recovering from the devastation of Hurricane Florence. Please continue to pray for God’s protection and that many turn to faith in Jesus Christ in these difficult times. More than 800,000 residents are without power in communities in the Florida Panhandle, Alabama, Georgia, and the Carolinas after Hurricane Michael ripped into the Gulf Coast and churned its way into Georgia. Two deaths have been reported. Samaritan’s Purse staff are prepared to enter the hardest hit areas in Georgia and Florida. Please pray. Click here to volunteer. After making landfall along the Gulf Coast earlier today, Hurricane Michael plowed its way into Georgia as a Category 3 storm. Its projected path carries it through the Carolinas where residents and our volunteers continue with recovery efforts after Hurricane Florence. Please continue to pray for Florida residents, residents of the Carolinas, and our volunteer teams as they work to help storm-weary communities in Jesus’ Name. As Hurricane Michael—a monstrous Category 4 storm— makes landfall, pounding the Gulf Coast and the Florida Panhandle with maximum sustained winds of 155 miles per hour, please be praying that God will spare human life and minimize the potential damage to property. Florida Governor Rick Scott has declared a state of emergency for 35 counties. Tens of thousands of people were ordered to evacuate the area. Samaritan’s Purse staff are prepared with equipment ready to respond to help those in need along the Gulf Coast and in Albany, Ga., where Michael is expected to pass through as a Category 2 storm. We have already been in touch with church partners in the storm’s path. Destructive winds, flooding rainfall, and a catastrophic storm surge of up to 14 feet are threatening both coastal and inland areas. The storm roared ashore near Panama City, Florida, and is expected to move rapidly to the northeast, through parts of Alabama, Georgia, South and North Carolina, and Virginia. The fear is that it will affect parts of the Carolinas still recovering from Hurricane Florence. Even as we prepare for a response to hard-hit areas of Florida and the southeast, volunteer teams continue recovery efforts in the Carolinas as well as rebuild projects in hurricane-damaged communities throughout coastal Texas. Please continue to pray for our staff, volunteers, and homeowners as they rebuild their lives after these devastating storms.